Esther Garcia is a tattoo artist and designer in Chicago, IL. Predominantly self-taught, she brings a unique curiosity and rigorous investigative method to all artistic projects. Her tattoos are immediately recognizable not only by their natural & botanical imagery, but also their organic body placement and unusual techniques. 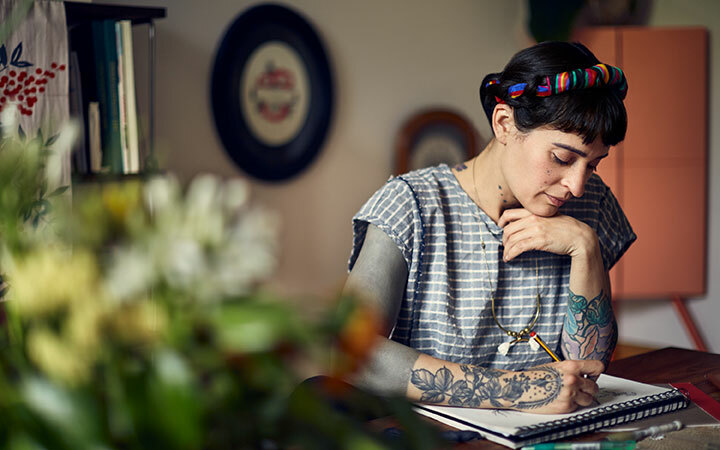 Previously the owner of Butterfat Studios (a private, all-female artist driven tattoo shop in Chicago’s Logan Square neighborhood) and having recently celebrated 20 years in the tattoo industry, Ms. Garcia now turns some of her attention to new projects. One such endeavor is Flower Thieves, a textile & commercial design collaboration with graphic designer Kyle Letendre. She is also currently planning a series of traveling seminars to promote continued education among tattoo artists, encourage young artists to find their unique illustrative style, and cultivate a sustainable and healthy business practice.